Bruce Wayne invites the Joker, the Riddler, and their goons to a nine-course dinner at Wayne Manor to settle the differences between the two villains. Each villain debates and discusses his wants while Wayne tries to mitigate and arbitrate their discussion. What can go wrong? 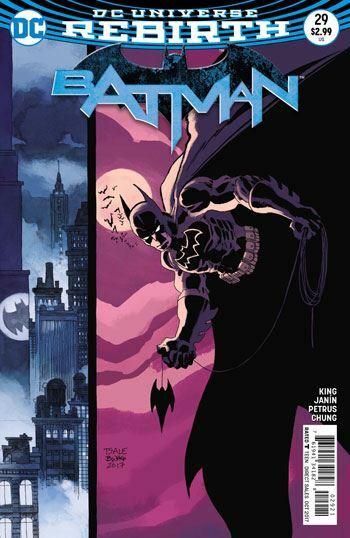 This issue took me by surprise as I did not expect Tom King to deliver such a tale for Batman. It breaks every cannon but this is why this story is probably one of the best in this run. King uses the metaphor of the nine-course dinner to explain the negotiations between the villains while explaining the purpose of each meal Doing this, King relies on centuries of French savoir-faire and haute-cuisine as the foundation of his story. 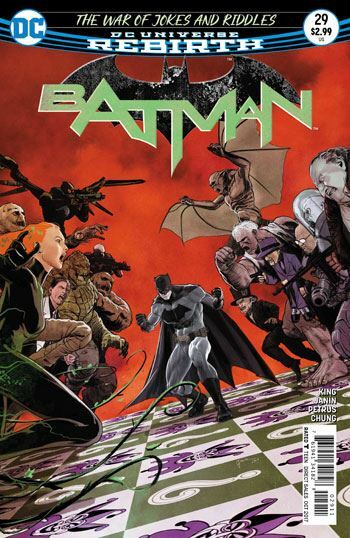 So far, each chapter of this storyline has been a self-contained marvel that when added to the rest of the tapestry will create one of the most memorable Batman story in years. Now, I have criticized some of these standalone stories but the one presented this issue is one of the best that redefines Batman and Bruce Wayne. You must imagine the strength of character Wayne must have shown to have all these villains in his home and avoid any major conflict. Bruce Wayne is more than a dilettante. Mikel Janín draws great crowed scenes and the use of space, where the Joke constantly occupies the left, while the Riddler the right, is well done. King uses many parallels in his stories and Janín can execute them well. Now my only question is how is it that all the goons just stood there and had no meals of their own?